Dubai: The Women’s Sports Committee of Dubai Sports Council (DSC) launched an innovative event to mark half a century of service of His Highness Shaikh Mohammad Bin Rashid Al Maktoum, Vice-President and Prime Minister of the UAE and Ruler of Dubai. 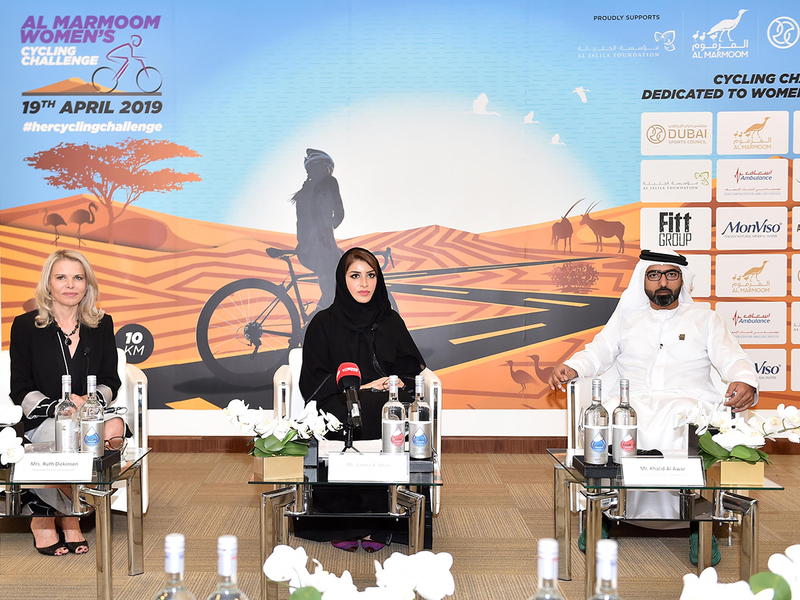 Called the ‘Al Marmoom Women’s Cycling Challenge’ — the region’s first cycle race dedicated solely to women — will take place inside the Al Marmoom Desert Conservation Reserve on April 19. The announcement was made at the Dubai Sports Council (DSC) by Lamia Abdul Aziz Khan, member of DSC’s Board of Directors and president of the DSC Women’s Sports Committee, in the presence of Khalid Al Awar, director, Sports Events Department at DSC, event director Ruth Dickinson, Dareen Barbar, Lebanese amputee athlete, Zahra Lari, Emirati figure skater and Salma Esmail, social media influencer from Egypt. “This is the first women’s cycling challenge in the region and it is dedicated solely for women in an attempt to give our girls and women across all nationalities the opportunity to have sports as a lifestyle,” Khan told media. “As we celebrate the Year of Tolerance in the UAE, we encourage all women, from our wonderfully diverse segments of the society, to come out and participate in this very special event inside the idyllic Al Marmoom Desert Conservation and make it a day to remember,” she added. Taking place under the umbrella of DSC and supported by DSC’s Women’s Sports Committee, the Al Marmoom Women’s Cycling Challenge is dedicated to Shaikh Mohammad for his unwavering support and empowerment of women and their role in all areas of society. The cycling challenge, that will take place at the Al Qudra Cycling Track, also announced its support for Al Jalila Foundation’s paediatric programme ‘Farah’, that offers hope to children suffering from cancer and other chronic diseases. The organisers has pledged to donate a percentage of all revenue from registrations and sponsorship toward this programme. The event is open to women of all abilities and nationalities with participants under-18 years required to provide a consent letter from their parent or guardian. Participants can register either as individuals or teams with individual categories divided into six age groups (Under-13, Under-15 years, Under-19, Under-39, Under-49 and 50-plus. The team competition will take place in three categories, namely teams of four plus in the kids, juniors and adults categories. There are three distances, namely 10km for kids U13, 20km for juniors U15 years, 20km for adults over 16 years and 50km for adults over 16 years. Trophies will be awarded to the top-3 in each category, all finishers will receive medals and all participants will receive a souvenir T-shirt.